The Qube line is so exciting. It really opens up endless possibilities to create. The Serendipity Specialty Set is a must have addition for your sewing room. AccuQuilt has a new block set, GO! 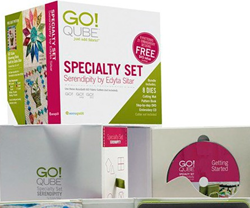 Qube™ Specialty Set -- Serendipity by Edyta Sitar, which features eight unique dies that are designed to work together to provide endless creative possibilities for quilters. The set includes both geometric and applique dies and is perfect for quilters of all skill levels. As with the original GO! Qube Mix & Match Block Set, Serendipity by Edyta Sitar is yet another convenient set of dies made with the quilter in mind. The set includes everything a quilter needs to get started, and all they have to do is add fabric. The set also comes in the same innovative packaging as the GO! Qube and features embroidery software with seven designs offered in 11 embroidery formats. The embroidery CD is especially beneficial for beginner quilters. "The Qube line is so exciting. It really opens up endless possibilities to create. The Serendipity Specialty Set is a must have addition for your sewing room," said AccuQuilt President Greg Gaggini. The GO! Qube Specialty Set includes a block or quilt pattern for each die in addition to a Block of the Month pattern. There is also a DVD featuring Edyta who provides detailed instructions for all of her designs, including the more challenging ones. She also shows other creative uses for the dies as well as incorporates a variety of applique stitching options. This Specialty Set is essentially an Edyta Sitar quilting class in a box. Some of the shapes in the Serendipity by Edyta Sitar block set include GO! Basket, GO! Flower Accents and GO! Little Butterfly. These shapes, although small in size, can be cut accurately and effortlessly with any cutter in the AccuQuilt GO! Fabric Cutter line. The set is value priced at $229.99 to save customers money. In comparison, if the dies were bought separately, the price is $252.91. The GO! Qube Specialty Set - Serendipity by Edyta Sitar is available online at accuquilt.com or at your local retailer. Headquartered in Omaha, Neb., AccuQuilt offers quilters, fabric crafters and retailers a premiere line of fabric cutters, dies, quilting patterns and other quilt and fabric cutting solutions that help quilters quickly and accurately cut shapes for quilting and fabric crafts. AccuQuilt also offers quilters a wide variety of rich educational resources to enhance their quilting experiences. Cutting with AccuQuilt cutters is a natural evolution of fabric cutting methods. "First scissors…then rotary…finally…AccuQuilt" for fast, easy, accurate fabric cutting. For more information, visit accuquilt.com or call 888.258.7913.